Savory Crepes (Блинчики с Мясом) - Let the Baking Begin! Savory Crepes (Блинчики с Мясом) are delicious crepes filled with Beef & Mushroom filling. They’re great as a make ahead or freezer meal. Make them for breakfast, lunch, or dinner – they will be a hit any time of day! Oh, and they reheat well too! If you enjoy Crepes, check out these other crepe recipes. 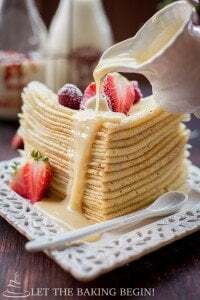 As you thought I was done with my crepe mania here I bring you yet another recipe that involves crepes. This time its a super delicious savory rolled crepe filled with mushrooms, beef vegetable sauté and some round rice for good measure. Some might even call them Rissoles, but I grew up calling it Блинчики с Мясом (Meat filled Blinis). Adding rice to the filling is not the most traditional way of making the filling, but as I was making the filling I decided that adding rice would make these savory crepes little more filling and perfect as a dinner. But, if eating two of these big honking Savory Filled Crepes is too much for you, you can definitely cut each one diagonally, set them cut side up and serve them as an appetizer. Hot or cold, they’re delicious either way. My favorite way to eat them is by dipping them by into some slightly seasoned sour cream or greek yogurt, but I think sweet and sour sauce would be great with this too. You know my love for make-ahead recipes and this one is somewhere high up on my recipe list, since everything, but the last step (browning in some butter) can be done a day or two ahead and just stored covered in the fridge until you need it. If freezer meals are your thing, you can even freeze them in a ziplock or a container until you need them. And guess, what? Since these Beef filled Crepes taste great cold as well, they make awesome leftovers for lunch. Tell me this is not awesome? Have you had these before? How do you like to eat them? Yield: 20-25 crepes made using this, or this recipe. Make Crepes using this, or this recipe. 1. Heat skillet with a couple of tablespoons of oil over high heat, then add cubed meat and brown it on all sides over medium high heat. Remove meat to a bowl. Return skillet back on the stove. Alternatively, you can cook beef in a pot of water until it’s soft (about 1 hour). You can also use meat & beef/chicken liver in ratios 1:1. Liver adds a nice flavor to this particular dish. If you like pate or liver mousse, you will appreciate the liver in here too. If you decide to use the liver, brown it last, when you’re done with the beef and the vegetables. 2. Add chopped mushrooms and sauté them over high heat until golden in color. 3. Next, add diced onion and cook over medium heat until the onion is softened up and translucent, about 7-10 minutes. 4. Then, add the shredded carrots and cook over medium heat until soft. You can add 1/2 cup water to the skillet and cover with a lid to aid the process. 5. Use a blender or a grinder to grind all your meat (and liver, if using). You can also just grind all ingredients including the mushrooms, but I like to have little pieces of mushroom and rice in there, so I only ground up the meat. Now combine the meat, mushroom sautee, cooked rice, garlic powder, salt & pepper in a bowl. Thoroughly mix. Pour about 1/2 cup of broth (or more as needed) to bind the filling. The filling should stick to itself and not be very dry. Turn all your crepes golden side up. Add 2-3 generous spoons of filling in the middle of the crepe. Spread it around in the middle third of it. Fold the right and left side towards the middle. Now make 3-4 folds to create a flat roll. The filled crepes can be sauteed in some butter or oil in a skillet over medium heat on both sides until golden, or see below for one more option. Whisk up 2 eggs with 2 tablespoons milk & a dash of salt. 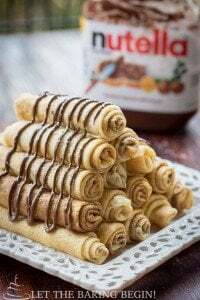 Roll each stuffed crepe in the egg wash and fry it in a heated to medium heat skillet with some oil or butter on both sides until golden in color. Serve hot with salted sour cream or sweet and sour sauce. That is it my friends, go ahead and enjoy! Potato Perogies – Perogies filled with caramelized onions and potatoes. Meatballs – Juicy meatballs in a jalapeno cream sauce. Meat Stuffed Crepes – Another great crepe recipe. 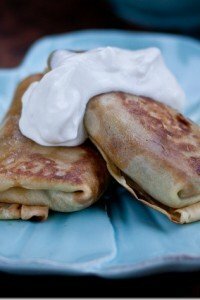 Savory Crepes (Блинчики с Мясом) - Delicious crepes filled with Beef & Mushroom filling. They're great as a make ahead or freezer meal. Make them for breakfast, lunch, or dinner - they will be a hit any time of day! Oh, and they reheat well! Yiled: 20-25 crepes made using this or this recipe. Heat skillet with a couple tablespoons of oil over high heat, add cubed meat and brown it on all sides over medium high heat. Remove meat to a bowl. Return skillet back on the stove. Alternatively, you can cook beef in a pot of water until it's soft (about 1 hour). You can also use meat & beef/chicken liver in ratios 1:1. Liver adds a nice flavor to this particular dish. If you like pate or liver mousse, you will appreciate the liver in here too. If you decide to use the liver, brown it last, when you're done with the beef and the vegetables. Add chopped mushrooms and sauté them over high heat until golden in color. Add diced onion and cook over medium heat until the onion is softened up and translucent, about 7-10 minutes. Add the shredded carrots and cook over medium heat until soft. You can add 1/2 cup water to the skillet and cover with a lid to aid the process. Use a blender or a grinder to grind all your meat (and liver, if using). Combine the meat, mushroom sautee, cooked rice, garlic powder, salt & pepper in a bowl. Thoroughly mix. Pour about 1/2 cup of broth (or more as needed) to bind the filling. The filling should stick to itself and not be very dry. Option #1: The Savory Crepes can be sauteed in some butter or oil in a skillet over medium heat on both sides until golden, or see below for one more option. Option #2: Whisk up 2 eggs with 2 tablespoons milk & a dash of salt. 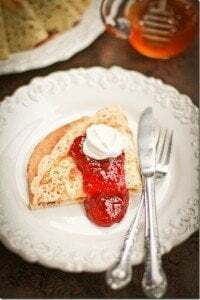 Roll each stuffed crepe in the egg wash and fry it in a heated to medium heat skillet with some oil or butter on both sides until golden in color. Serve hot with salted sour cream or sweet and sour sauce. Serve hot or cold with salted sour cream or sweet and sour sauce. That is it my friends, go ahead and enjoy! Hi Marina, which crepe recipe do you most recommend for the savory version? Best savory crepe filling that I’ve tried! Thank you! They were a hit! Thank you so much Vita! Oh. My. Goodness, Marina!! This is the best recipe I have EVER made! This was something I ALWAYS wanted to be able to make this UTTER AWESOMENESS!!!!!! I LOVE IT and my children want it for breakfast lunch and dinner!! Marina, we all LOVE this recipe. You.Are.A.Genius! Woa! I think You just swept me off your feet with your awesome comment lol! Thank you for your feedback and I am so so happy that you liked them! your thinking is really great. I love savory crepes very much i can’t explain in word. Great idea, I love savory crepes! If this is Russian cuisine, I want to learn more. I just love these savory crepes! Marina, I make crepes often but this recipe….revolutionary (at least for me, he he). Made them in my Vitamix and did not even have to take off the foam as there wasn’t any? Anyway, your recipes rock! Oh this makes me happy, happy :D! Which recipe for crepes did you use though? The buttermilk or the milk based? Anyway, thanks for sharing your success! It’s Mother’s Day here in England and all I want for lunch is these blinchiki!!! They look incredible and so similar to how my mom used to make them! Pinning for later!